Fred Hoiberg is a professional basketball coach and former player with 10 NBA playing seasons under his wings. He took up his first head coach job in the NBA in June 2015 with the Chicago Bulls after five coaching seasons with the Iowa State Cyclones. Besides the great work he is putting in on the court, Hoiberg has been doing even more in his home front with his wife of over two decades. Read on to find out the details. He was born a highly talented boy on October 15, 1972, in Lincoln, Nebraska and named Fredrick Kristian Hoiberg by his parents, Eric, Iowa State sociology professor, and Karen Hoiberg, an elementary school teacher. His family moved to Ames when he was 2, which was where his interest in hoops was sparked. While in grade school, he spent time with the Iowa State basketball team as the ball boy, ultimately falling in love with not only the town but also the program he would one day play for as well as coach. His athletic prowess soon came to play in Ames High School in Ames, Iowa where he played quarterback for the Little Cyclones football team and captained the basketball team. He had a standout career in both arenas. Hoiberg led the basketball team to a 1991 state championship and was also named the Mr Basketball of Iowa State the same year. In 2012, the National Federation of State High School Associations announced that Hoiberg was elected to the National High School Hall of Fame. Following his high school carer, he chose his hometown Iowa State Cyclones over many other offers such as Nebraska, Arizona, and Stanford. Therein, he entrenched his name on the Cyclones annals. He also joined the Pi Kappa Alpha fraternity. Fred Hoiberg was a First-Team All-Big Eight selection in 1995 and finished his career with 1,993 points, third-most in program history. During his collegiate days, he was known as an all-around player and was very popular too, with his name found among the top seven positions for nearly every statistical category. He was also nicknamed, The Mayor, a nod to his popularity. The moniker came about after he received several write-in votes during the 1993 mayoral race in Ames. To honor their top-notch player, Iowa State has retired his number 32 jersey. He graduated in 1995 with a degree in Finance. The Mayor was selected by the Indiana Pacers with the 52nd overall pick in 1995, marking the beginning of his decade-long playing career in the NBA. For the next four years, he played in 139 games, averaging 3.9 points in 11.6 minutes per game. In 1999, he signed as a free agent with the Chicago Bulls and then in July 2003, he joined the Minnesota Timberwolves, where he was highly lauded as a three-point specialist. In his final NBA season, he led the league in 3-point shooting percentage (48.3%). 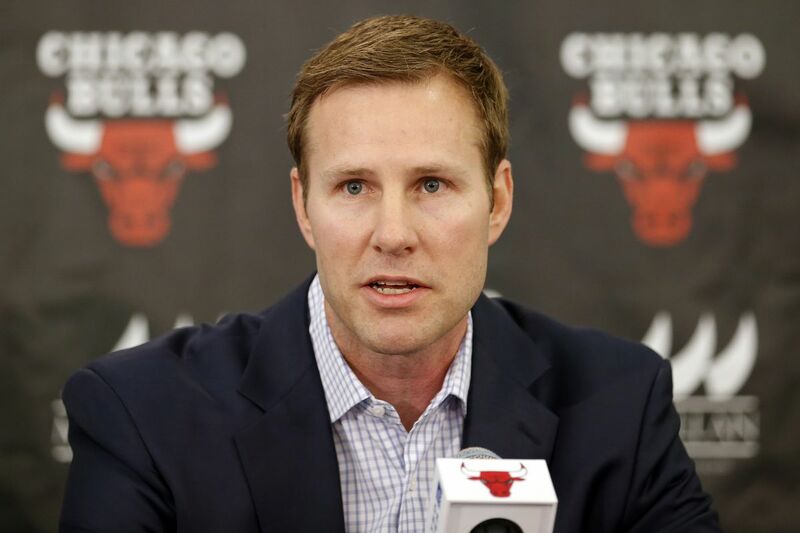 Fred Hoiberg underwent an open-heart surgery and a pacemaker in June 2005 to correct an enlarged aortic root. Though the operation was successful, he decided not to make a return to the court, retiring in April 2006 to take an administrative job. With his playing days behind him, Fred Hoiberg took a job in the Timberwolves front office as an assistant general manager. In time, he rose through the ranks and was promoted to the vice president of basketball operations in 2009. The following year, Fred accepted the head coach position of the Iowa State Cyclones, making a return home. As the school’s 19th men’s basketball coach, he coached the team for five seasons, making the NCAA Tournament in four of those seasons (2012 to 2015), two Big 12 Tournament Championships. He was also named the 2012 Big 12 Coach of the Year in 2012 and became the fastest coach in Iowa State history with 100 wins (in 148 games) on December 31, 2014. Afterwards, he returned to Chicago Bulls, but this time, to take up his first job as an NBA head coach. Hoiberg was hired as the 19th head coach in Bulls franchise history in June 2015 under a five-year contract. Although he has not had the best start as an NBA head coach; he has not led the Bulls to much success, the system he has designed may very well show that he was the right choice for the task. He is set to take the bulls by the horns going into his fourth season. Fred met his future wife, Carol Sarah McGee in Ames High School and they have been together since then. They are proud parents to four lovely children; a daughter, Paige, and three sons – Jack (born March 11, 1999) who plays college basketball at Michigan State University and twins Charlie and Sam born on March 21, 2003. The only girl in the fold, Paige is also immersed in hoops like his father and brother. She was a basketball and track standout at Gilbert High School, Iowa and is enrolled in the University of Kansas, with a major in Strategic Communications and a minor in Business and Sports Management. Moreover, she works part-time as a Student Office Assistant for Jayhawks men’s basketball coach Bill Self. Paige hopes to continue to make connections in the sports world and work in the sports industry in the future. The coach and former player is of the stuff athletes are made of; towering height and commensurate weight. His body weighs 203lb (92kg) which is borne by his 6’3″ (1.93 m) frame.